Poppy is a beautiful welsh pony, she is in a dealers yard and if we can’t raise the 250€ to save her, she will be shipped to Italy for slaughter next week. STOP! Think about what you are you about to do. Each time he dupes the public into buying, he puts the profit in his own pocket and pays for his family to eat. These dealers will take a picture of one horse and put it on sites all over the net. Perhaps four different groups will raise the money to save poppy, just lucky for the dealer he has another three ponies in his yard that look just like Poppy. I have been fighting these dealers for over 40 years and I can assure you they are laughing all the way to the bank. We have taken several of these horses because they were saved by sites in the UK and France and for one reason or another they were unfit to make the journey to their destination. The lorry usually turns up at night. The transporter paid for by her rescuers. Paperwork often illegible. faded or water damaged . On two occasions, we did not receive the advertised horses. These are the meat men please dont give them your money. I have been around for a long time and I am sure some of our old friends will remember this story. One Wednesday afternoon she arrived at the field and her pony was gone, she asked at a nearby house, they told her it was the day of the horse sales and perhaps he had been taken there. With a friend she went to look and sure enough there he was, he had be sold to one of the meat dealers, so as we all know, from a child’s perspective the obvious thing to do is to steel it back. The pony was eventually tracked down and the meat man picked the pony up. The Girl was inconsolable so her parents phoned the meat man and offered to buy the pony from him, the meat man said no. Later that day the girl’s friends and family had a whip round and offered double what the pony was sold for. The meat man said no. when asked to say his price, the meat man said, I would rather kill it than let that child have it. Bill was a farmer/dealer and on one occasion he was telling me about his Father and his childhood on the farm. He said when he was about 9 years old, he asked his father if he could raise his own steer and perhaps show it at the agricultural show and Bill’s father agreed to this. For a few months everything was going well, until one day at the end of the summer his father thought the calf was not going to make the grade and decided to send it to slaughter. 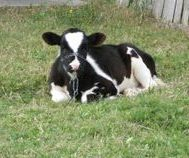 Bill was so angry at his father’s decision that he took a hammer out of the workshop and beat his father’s favourite calf to death. When Bill grew up he had one son, his son produced one son who was severely brain damaged. Soon after the birth of their only grandchild Bill’s son was killed in a farming accident. Devine intervention? Perhaps or the madness of man. We call for an end to slaughter without pre-stunning for all animals. EU and UK law requires all animals to be pre-stunned before slaughter to render them insensible to pain until death supervenes. But non-stun slaughter is permitted for certain communities. We support BVA, RSPCA, HSA, FAWC and FVE who conclude that scientific evidence shows that non-stun slaughter allows animals to perceive pain and compromises welfare. There are no specific EU or national legal requirements governing the sale and labelling of halal or kosher meat. Head out onto the moors in summer and see the groups of coloured ponies, grazing in the sun. the foals playing and gamboling across the open ground there is nothing better to show the joy of life. Sadly, if you were to stand in the auction just a few short weeks later you would see a group of fat old men making those terrified tiny foals run round in circles, and for what? just to say this foal is not worth £10. Very few of this years foals will find a homes. people just don't have the disposable income to save them. The fact is together we can make a difference to their life and we can make sure they don't end up in the knackers. The Epona Trust is looking for sponsors and helpers to open a new centre dedicated to the Dartmoor pony, not the pure breed that everyone wants but the ponies nobody will buy. I know these ponies, I have spent my entire life working with them. They are intelligent, strong and they learn quickly, they are funny and quick witted always putting you on the wrong foot. The wild pony is an Extraordinary animal and the people who turn them into sausages are obviously ignorant to the language of the equine. Thin and weak after the winter rains and winds, the mares will give birth to their foals in the spring The Dartmoor mares will have no proper cover or feed during the winter. Hundreds of healthy ponies are being needlessly slaughtered and sold to zoos as animal feed because a fall in market price has left left breeders struggling to sell them.Over 700 Dartmoor hill ponies have been killed in the last 12 months as breeders attempt to reduce their herds.In 1980, the population was estimated at around 30,000, but this figure has steadily dwindled to around 1,500 this year. 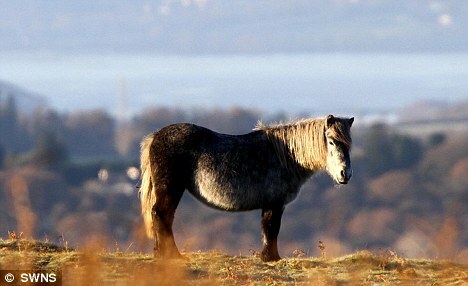 My little pony: But the problem for ponies on Darmoor is that not enough people want, or can afford them. Around 700 of the ponies have been shot in the last 12 months - 100 of which were healthy foals that had not been sold at market due to the recession. The others were older ponies rounded up for slaughter by breeders who were ordered to reduce the numbers in their herds to help the market recover. A healthy foal is normally sold privately to riding schools or individual riders for around £100, but the recession has seen the demand dry up. Knackerman Andrew Goatman, of South Brent, Devon, (corr) said he normally disposes of around 100 Dartmoor hill ponies each year - but has seen this figure rocket to seven times that over the last 12 months. Yesterday he warned the breed faces extinction if the current rate of slaughter continues. He said: 'I've shot 700 ponies this year which is a massive increase on previous years. 'If this continues there is a realistic possibility that they could become extinct. 'We could find there will be none left at all in a few years. The market has been dire for the ponies over the last year. Around 250 of the animals put-down by Mr Goatman have been sent to zoos across the country, where they were fed to animals including lions and tigers. Some were foals, normally bought for around £100 for riding, which failed to sell at market this year because of the financial climate. 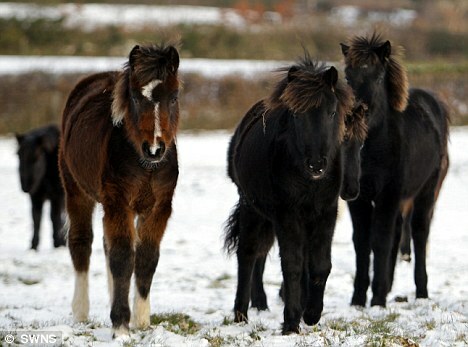 Charlotte Faulkner, of the Dartmoor Hill Pony Association, confirmed a 'welfare disposal system' was in place because the market for foals was so poor. She said: 'At the moment the market for the foals from the moor are at rock bottom as a result of the credit crunch and legislation. 'This creates a welfare problem as they cannot go back on the moor and the breeders cannot keep them in all winter. 'We had to react to the recession and this ensures that the ponies don't end up becoming welfare cases, which is what is happening in many other parts of the country Breeders, who keep the ponies in herds on the moor, remove foals at around six-months-old and take them on to agricultural land for weaning.' The animals are then taken to market, where around 500 are normally sold every year but, although exact figures are not available, this figure is thought to have dramatically reduced over the last 12 months. Lonely: In 1980, the population of Dartmoor ponies was estimated at around 30,000, but this figure has steadily dwindled to around 1,500 this year. Breeders have also brought hundreds of older ponies for slaughter this year after being told by authorities to reduce the numbers in their herds. A Pony Action Group, which includes Natural England, has been set up to cover issues such as mare and stallion fertility management. Andy Guy, an advisor with Natural England, said a "ten point plan" had been drawn up to reduce the size of the foal crop. He said: 'The Pony Action Group is continuing to find a workable strategy, part of which is to reduce the number of foals coming to the market. 'These include measures to improve the value of ponies and reduce the size of the foal crop to match demand. How this is achieved is down to the pony keepers to agree. Ok everyone, we must now get back to work to end this vile trade,Can you help? Horses are shipped across Europe for slaughter. many end up in slaughter houses in Italy. Horses are shipped from England to northern Ireland, they are still on UK soil. they then pass across the border into southern Ireland, this is Europe, and from there they can cross to mainland Europe. Horses are shipped from eastern Europe to the UK. Why are horses from the north more valuable in the south and horses from the south more valuable in the north. Where is the profit? these huge horse-boxes are expensive to run and the ferries don't take them free of charge. Help us find the profit and we can help stop the trade. Your identity will be protected. Thank you for reading this and I hope to hear from you soon.